Remember the days when our parents would hand us a $5 bill for cleaning our rooms, setting the dinning room table and other chores? Well, giving an allowance to your kids may no longer mean just handing them cash. Why? Because now there’s an app for that! Several, actually. These smartphone apps are automating the allowance process to help parents and kids more closely manage this weekly ritual. But how good—and necessary—are these tools? I test-drove some of the most popular ones to see for myself. Then I had my 13-year-old son do the same. We thought Allowance Manager Pro and iAllowance were best. Allowance Manager is an online tool that allows parents and kids to track how much money they have in their allowance account (think: accounting ledger in kid speak). There are two versions: Basic and Pro. Allowance Manager Basic is a free app that provides parents with an ongoing tally of how much money their child should have and how much is owed to him. You can set it up to automatically “deposit” the regular allowance each week. No money is actually exchanged electronically here—this is simply a tracking device. Kids then let parents know when they want to “withdraw” their money. Then parents can break out their own debit card to pay for a child’s purchase or dish out the cash. Parents can also restrict its use at certain stores, such as video arcades, fast food restaurants or wherever else you don’t want your kids going. The card is PIN-protected, and since it’s prepaid with their allowance money, kids can’t spend more than they have. This version of Allowance Manager runs $6.75 a month (plus a $10 activation fee) or, if you want to pay annually, $69 a year. That does increase the money I spend on my son’s allowance by nearly 13% annually. (I give my son $10 in allowance each week.) So that is an expense I will have to consider. Truth be told, neither my son nor I found the basic app especially helpful. Sure, it was easy to use and provided automatic updates each week, but having one more app to manage seemed to complicate the just-hand-over-$5-every-Sunday routine. Allowance Manager Pro is a different story. Despite the price, this is an app that my son and I would potentially use year-round since it acts like real money versus just a tracking tool. “I like the idea of having my own debit card,” my son said. “Then I don’t have to carry around so much money and worry about losing it all the time.” That’s something that has happened in the past due to a gaping hole in his jeans pocket. Cost: Free on iTunes or online, Pro version is $6.75 a month (with $10 activation fee) or $69 a year. 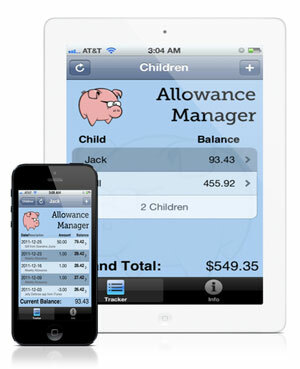 iAllowance LT is a sophisticated allowance tracking, reward and spending tool for parents and kids, and it’s free. With this app, allowances can be scheduled to be paid automatically every week or whenever you’d like, just like with Allowance Manager. Additional credits can also be posted automatically on special occasions, like birthdays and holidays. Not only can you add money to your child’s account, you can deduct it too. Hmmm, remember that room that never got cleaned or that cell phone they promised to pay for? You decide if a chore gets paid when it happens or if the entire week’s worth of chores need to get done first. It’s pretty simple to keep a tally of how much your child has received and how much he’s owed with iAllowance LT, but you have to input the transactions yourself. I actually liked this app better than the free version of Allowance Manager because it seemed more user-friendly and offered additional features—like the ability to track household chores. Bye, bye, refrigerator chart! Allowances can be directly tied to your child cleaning his room, taking the dog for a walk each day or mowing the lawn. You decide if a chore gets paid when it happens, or if the entire week’s worth of chores needs to get done first. “This is an easier reminder of what I have to do, and I like the chalkboard design,” my son said about the way this app was laid out. The other thing I really liked is its ability to set up different “bank” accounts. With each week’s allowance, you and your child decide what portion of the money should go to spending, savings or charity—a good way to teach financial management and philanthropy. Now remember, this is still just a tracking device, so no real money is ever exchanged—it simply serves as a reminder of how much they have and how much is owed. If you don’t want to use money as rewards, you can use stars—something my 13-year-old was not excited about, but a younger kid might be. You can also get an email summary of the amounts received and spent, like a bank statement, although that seems a little like overkill to me. 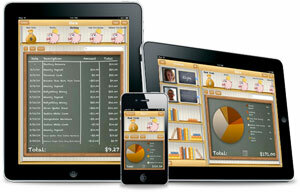 Overall, either of these apps could be a convenient financial tool for you and your family. Of the free apps, I liked iAllowance LT the best because its interface was the easiest to use, but my favorite was the Allowance Manager Pro, even though it is the most expensive. We’ve started using Allowance Manager at the end of June this year. It seemed very simple and when I had questions I was able to IM with customer service and it was great. Once my kids starting using their debit cards we noticed the program takes money out of their “account” twice. I’ve been trying to get in touch with customer service for a couple of months - no one is answering. I’m so disappointed - this was such a great idea. It seems like they should be able to work out the bugs, or at the very least, email me and tell me they are out of business. Thanks for the helpful feedback. Based on recent interviews the CEO is doing, it appears Allowance Manager is still in business, so no excuse for not responding to customers. Did you try their customer service phone number, as well? Thanks for the number. I tried it at 11:20 am; I wanted to call during traditional “business hours”. I got a standard automated message prompting me to enter an extension, press 0 for the operator, or press 1 for customer services. I got a recording asking me to hold for the next available agent. I was on hold for 1 minute. After one minute I got a recording saying all reps. were busy, and I was prompted to leave a message. I left a message; I’m not optimistic. If they call I will definitely let you know.